There is nothing like a South Carolina beach vacation when you can stay at a comfortable North Myrtle Beach resort condominium with your own ocean view. Finestere Condos in North Myrtle Beach, South Carolina is the place to stay. At Finestere Condos in North Myrtle Beach, you will stay in a North Myrtle Beach condo rental fit for six, seven or eight people. All of Finestere condos are two bedrooms with two bathrooms and each of the Finestere condos has its own private view of the Atlantic Ocean. You will be most comfortable when you rent one of these North Myrtle Beach condos. Finestere Condos in North Myrtle Beach, South Carolina is located on Ocean Boulevard in North Myrtle Beach. Finestere Condos is located comfortably in the Cherry Grove section of North Myrtle Beach, South Carolina. This North Myrtle Beach resort is only minutes from Highway 17 and from there you can enjoy unless Myrtle Beach area fun. 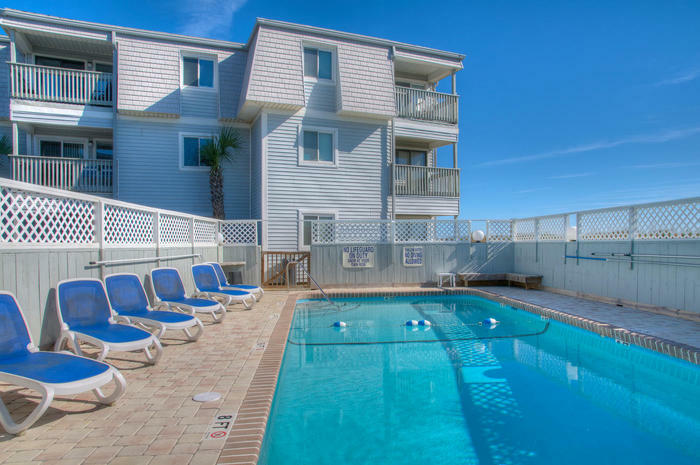 This North Myrtle Beach resort is located oceanfront where your family can enjoy the white sandy beaches every minute of your relaxing North Myrtle Beach vacation without having to drive anywhere. Close to the Finestere Condos you will find the famous Barefoot Landing. At Barefoot Landing you will find the most enticing shopping and restaurants that deliver the delicious food including local all-you-can-eat seafood. Barefoot Landing in North Myrtle Beach, South Carolina also has popular attractions including Alligator Adventure, The House of Blues and The Alabama Theater. All of these places offer live entertainment that everyone in the family can enjoy. You will also find the peaceful Intracoastal Waterway available to you at Barefoot Landing. You don’t have to travel far to find a great game of golf or more shopping, bars, and heavenly Southern cooking. The warm sand is only a few steps away from a wooden sundeck at Finestere Condos. This wooden sundeck has picnic tables that provide a place for you and your family to enjoy a delicious meal under the sun while enjoying the fresh South Carolina air. Don’t forget to bring a deck of cards to play a family game or great book and take advantage of this outdoor oceanfront wooden sundeck. This North Myrtle Beach resort also features a beautiful swimming pool. This swimming pool is only steps away from the sundeck, both located oceanfront and viewable from some of the balconies at Finestere Condos. Take part of your day to sit close to the Atlantic Ocean while you soak up the sun next to the swimming pool. You can take a soothing swim in the swimming pool when you’re ready to cool off from the South Carolina heat and your busy day in the sun. There is nothing like being able to enjoy the luxury of hearing the ocean while laying poolside at Finestere Condos. Elliott Beach Rentals is not affiliated with onsite management or the HOA of Finestere Condos.